A roleplaying community full of diverse and interesting people who are veteran roleplayers not only to the Garry's-Mod scene. This is incase I wasn't suppose to post the application in the thread two places above. Is it to be UU aproved? (Check roster if applicable): No. Have you been a Trader or BMD before? : I have served as a Black Market Trader on TnB Half Life 2 Roleplay for a year apart of a faction smuggling group called 'The Ring'. 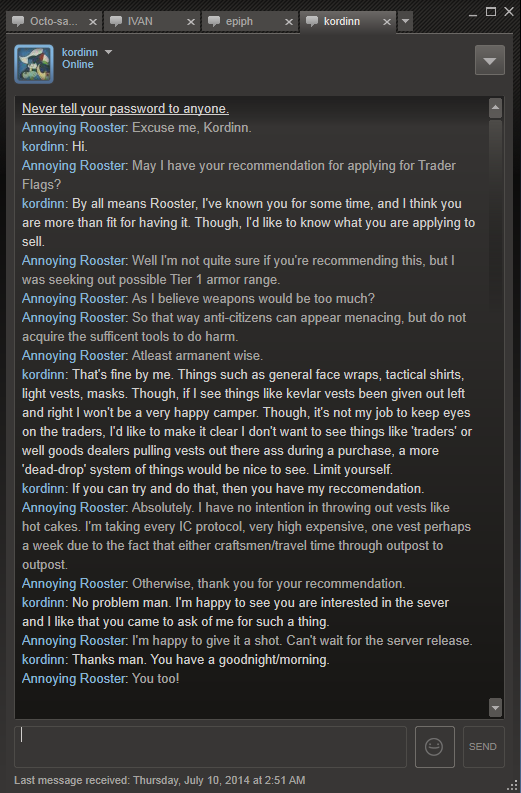 I have also served as a Trader on the S.T.A.L.K.E.R. server for General Gaming Lounge. Do you have any other flags or specialty? : Currently working on 'pet' flags, however none at this point. Explanation wise: It would require very strategic planning to collect supplies from one another. Not only with the potential risks of being spotted by COTA forces beyond the barriers of the city, but as well as Xenian beings that lurk the very shadows of the canals. Depending on the required amount, most travel solo with one or two makeshift vest carriers or other miscellaneous clothing aside. If it requires much more, then there could range a small band of anti-citizen fighters forming a protective veil among the smugglers. Once settled, it would be time to execute the travel. Reaching safe and sound, they would not hesitate but to proceed with the deal as quickly and discrete as possible. Doing whatever it takes to not draw attention, they'd sometimes preform this in public variations to prevent suspicion. However much could easily go wrong, albeit causing a large setback for the order of chest carriers, clothing apparel, etc. If something goes wrong, it'll either cause a sudden decrease in these items or prolong the adventure of the smuggler. One way or the other, no matter the consequence will the order make its mark. The app was okay, on my standards, even if not all of the paragraphs were really that long. Most of the time, paragraphs usually contain four sentences or more, but because you are literally the first to apply and Kordinn puts his faith into you, I'm going to let it slide for now. I would suggest adding a little bit more to it though so future applicants don't see yours as exmaple and write these really short paragraphs, no offense. Accepted, suggesting adding on more for the sake of looking good. Some prefer short and sweet, cut to the chase ordeal rather than lengthy chapters to review. Saves time and the effort for a quick and clean review if that makes sense. I've done this before, as I was denied due to the amount of effort I put into one application. I prefer long apps that embelish itself, gives me more content to think about and shows how literate the writer is. Locked, remember to post in the application thread, kiddies.